Stems tall, leafy and much branched, sometimes 10 or 12 feet tall, from a perennial root. Leaves thin in texture, minutely hairy above and on the margins, both basal and upper leaves pinnately divided and toothed, the lower into three to seven segments and long petiolcd, the upper leaves into three to five lobes and short petioled or sessile. Heads 3 to 4 inches broad. 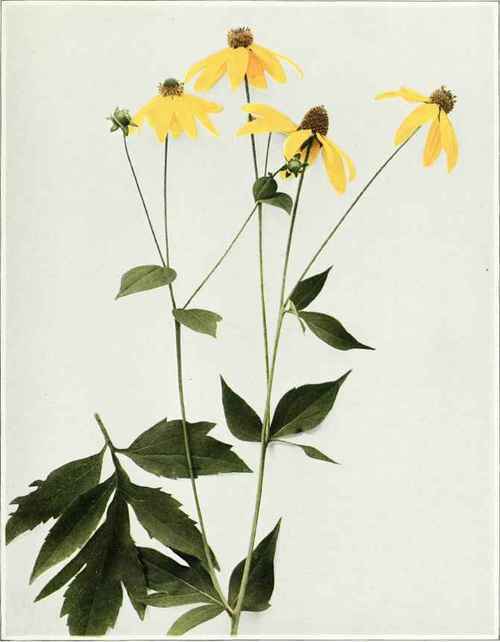 Ray flowers yellow, six to ten in number, surrounding the columnar, dull greenish-yellow disk which becomes oblong-shaped in fruit and two or more times as long as thick. Moist thickets and low woods, especially along streams, Quebec to Manitoba and Idaho, south to Florida, Colorado and Arizona. Flowering from July to September. This plant is the origin of the Golden Glow, a common garden variety in which the disk flowers are all transformed into ray flowers.